Oh, to what depths have we fallen even linguistically? The word sacrifice at its root carries the idea of sacre, Latin for holiness. And the phrase “sacrificing the lamb” here unknowingly takes its cue from the Agnus Dei, the Lamb of God, Christ who was sacrificed on the cross. Here is an awesome expression of God’s love and mercy highjacked to mean something so trite, so trivial. The sacrifice of the Lamb of God was not troubleshooting or firefighting like we might assume it to be. In medical parlance, it doesn’t appear to be just symptomatic treatment but prophylactic. Oftentimes, I think we imagine the Godhead at the beginning of the world seated with fingers crossed, zoomed-in on the Tree of Good and Evil, restless and nail-biting, waiting to see if Adam and Eve would fall a prey to the schemes of the enemy, or the “sneaky Snake” as my daughter says! When the story goes sour and the duo succumbed to temptation, we then imagine a frantic committee meeting called in heaven, brainstorming the way forward. And Jesus, standing up to volunteer “playing” Messiah, was unanimously voted to do the honors. But God’s salvific plan, the sacrifice, the cross, the Lamb of God himself is surely not a divine knee jerk on the startling discovery of the tragic fall of humanity and all its entailments. If the Lamb of God was chosen and slain in the plan of God from the beginning, it would require that even before the foundations of world were set in place, the wisdom of God saw, required, and provided this Lamb. But why would an all wise and perfect God go such extremes to sacrifice his priceless Son, the second person of the Trinity, to build something that would disappoint him and in turn require a supreme sacrifice to make it new again? Surely, that is incomprehensible love! Imagine a perfect family of three. Having no need. No flaws. No lacunae. Sufficient and complete in all aspects imaginable. Perfect in love and oneness. Inseparable. Harmonious. Utterly Perfect. They set out on a walk down their street one day and round the corner they meet a lost, rebellious, violent, broken, and dejected young lad inflicting harm on others and, most of all, on himself. The perfect family of love chooses to reach out, to help, protect, heal, restore, to love him. They adopt him into their perfect circle knowing full well that the adoption of this new son into the family would surely be a threat to the very life of their own precious Son. Sure enough, as they lavish their love and care on the adopted, one treacherous day, the true Son allows himself to suffer at the hands of the new kid brother. If this seems incomprehensible in the moment, surely it was. But imagine this being the very provision made before this child was even created, before the foundations of the world itself. Before creating sons and daughters to adopt into his circle of love, the Lamb was slain. 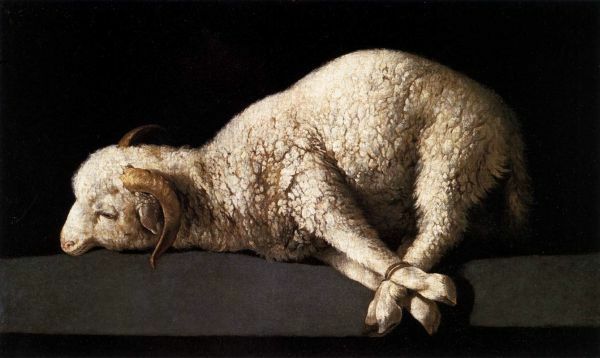 Francisco de Zurbaran, Agnus Dei, oil on canvas, 1635-1640, Museo del Prado, Madrid, Spain. Could it be that the Lamb of God was slain in the mind of God before the foundations of the world only to be revealed to us in the fullness of time? Here we have an eternal, triune God, whose very essence is love and God expresses it by creating this world and us to rule it all out of love. God enables us the high privilege of being loved, allowing us the pleasure of a faint taste of the fullness of love between the members of the Trinity. God wires us with the ability to not only be recipients of this love but also enables us to be agents of the same to others. But all of this required the Agnus Dei to be first sacrificed on the altar of love in the mind of God for this divine story of love to even unfold. Crude as it may sound, I can’t help but think of this God as a love-sick-someone who is incessantly and unashamedly pursuing and wooing his beloved, though she is far from innocent, though she turns her back on him and shuts him off. Only in this scenario, God is both the one who loves and the loving, sacrificial Lamb. 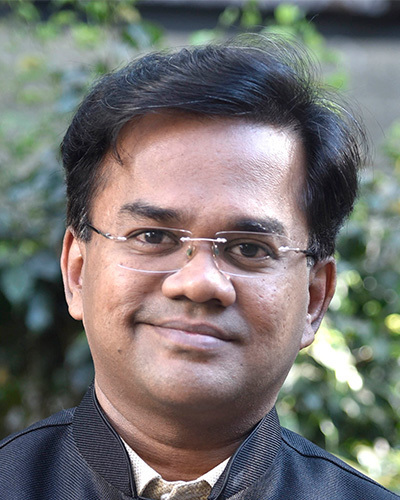 Charles Premkumar Joseph is a member of the speaking and writing team at Ravi Zacharias International Ministries and is based in Mumbai, India. 1. “Sacrificing the Lamb,” The Urban Dictionary. 2. 1 Peter 1:18-20 and Revelation 5:9, 12. 3. Ken Ham, “Slain from the Foundation of the World,” Answers in Genesis, April 7, 2007.